It was last summer when I first caught wind of an unusual food item that was a completely new concept to me and sold only at the Sturgeon Bay farmers’ market: stuffed chicken wings. 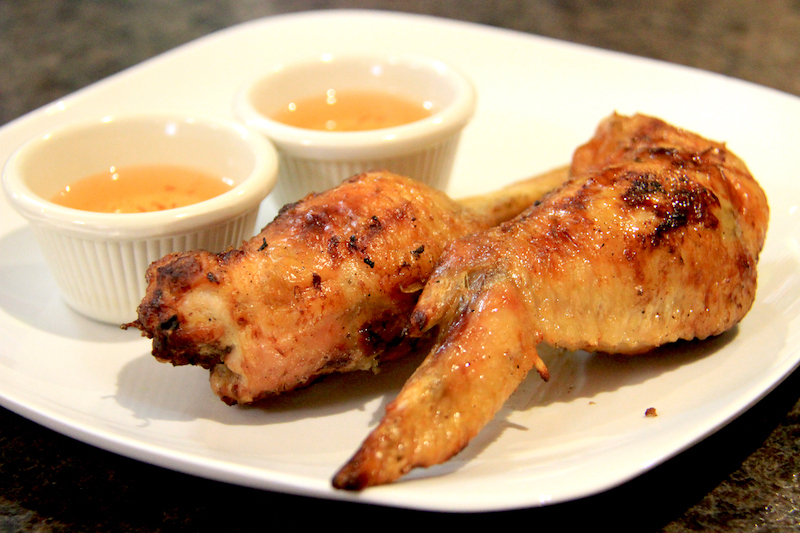 These delicacies were described as tender, juicy chicken wings stuffed with an Asian egg-roll stuffing. I had a vague idea of what stuffed wings could look and taste like, but I didn’t end up trying them before the market wrapped up in October. Luckily, I can now find them year-round, six days a week, at the new Dan’s Kitchen, 50 S. 3rd Ave. in Sturgeon Bay. Owner Dan Vue has been selling Southeast Asian fare at the Green Bay and Sturgeon Bay farmers’ markets for the past four-plus years, during which time he’s gathered a loyal following for his freshly made egg rolls, crab rangoons and stuffed chicken wings. And he became such a local favorite that his weekly visit up from the Green Bay area for the market wasn’t enough: Dan began to hear from customers that he should find a permanent location in Sturgeon Bay. “It was really my customers who encouraged me to start a restaurant,” Dan said. “Our customer base is mainly here [in Sturgeon Bay].” He will no longer be selling at the Green Bay market, but he will still sell at the Sturgeon Bay farmers’ market every Saturday, June through October, 8:30 am – 12 pm. A lot of patience and planning preceded the April 5 opening day. “It’s taken two and a half years of saving, finding a location and then securing licensing,” Dan said on opening day. The restaurant was two-thirds full when I arrived just after the lunch hour. “Good thing you came now, not earlier!” he said. “We had a rush for lunch.” Even as the lingering tables started to clear, new patrons steadily trickled in, each eager to take in the new space and congratulate Dan on his first day. Pad Thai. Photo by Aleah Kidd. 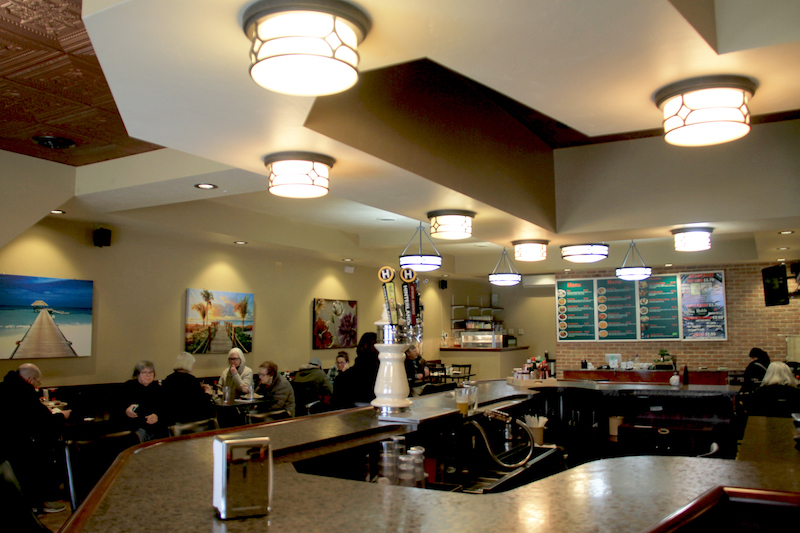 The menu features a variety of meal options – enough to make you ponder what to choose, but not so many that it makes ordering overwhelming. There is an appetizer list featuring the farmers’ market favorites of egg rolls, spring rolls, crab rangoons and stuffed chicken wings, and each is sold individually, making it easy to get a sampling or add one to a larger entrée. 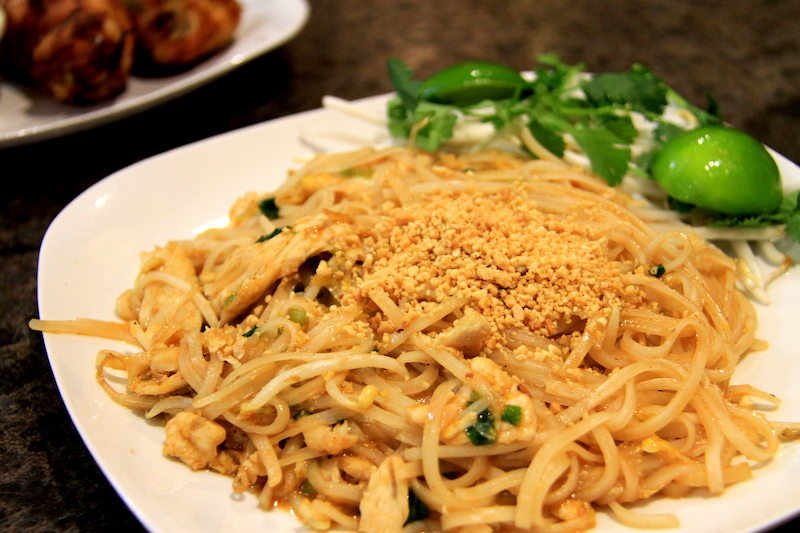 Among the main dishes are several rice plates, stir-fry options, curry-based meals, pho, pad thai, and noodle dishes. Drink options included Thai ice tea, coffee (using cardamom and sweet milk), a variety of bubble-tea flavors, soda fountain options, a bottled and local tap-beer selection, juice and water. 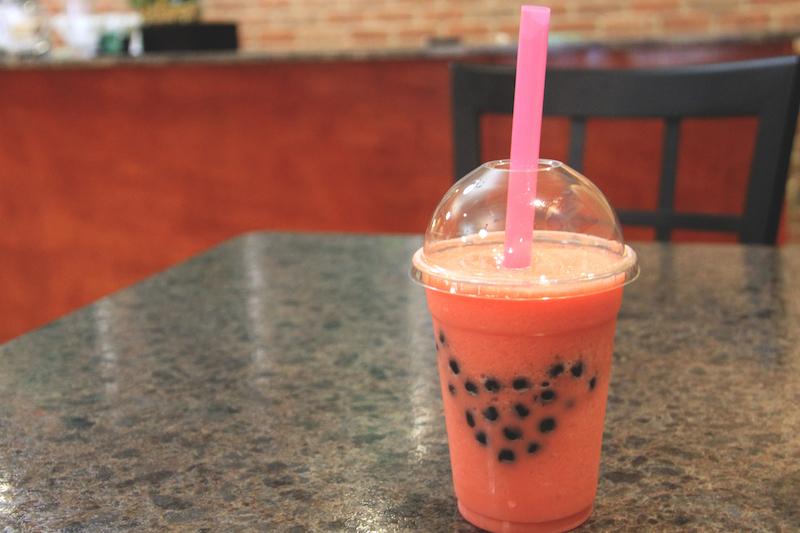 Bubble tea, sometimes called boba, is making gains in popularity and availability around the Midwest. It’s a Taiwanese invention that blends tea, milk, sugar and ice to create a creamy base. Then marble-sized tapioca balls are added. These “bubbles” or “pearls” have a dense, chewy texture and are slurped up through a thick straw made especially for bubble-tea drinks. I ordered a strawberry bubble tea, a chicken pad thai and – of course – two of the stuffed chicken wings. I had imagined these chicken wings as the standard bar variety of chicken wings, but I was pleasantly surprised with much larger versions. Two wings took up nearly a whole plate alongside the sweet-and-sour dipping sauce. Biting into one wing, I was again surprised to discover that the stuffed portion had been deboned, eliminating the need to nibble carefully around each joint. Instead, inside was an egg-roll stuffing made of cellophane noodles, cabbage and thinly sliced carrot. I could have easily eaten two chicken wings and been stuffed. Stuffed Chicken Wings. Photo by Aleah Kidd. Next on my list of things to try is the pho bowl. I watched as an employee sat down to a late lunch with a huge, steaming bowl and added a variety of toppings from the tray placed on each of the 11 tables. The tray held about 10 seasonings, sauces and spices, which Dan told me are primarily for customizing pho bowls. Being a pho novice, I look forward to testing out the flavorings. He favors pho alongside the fried rice and curry noodle. Strawberry Bubble Tea. Photo by Aleah Kidd. Dan’s recipes come from his travels to Thailand and visiting his hometown in neighboring Laos. 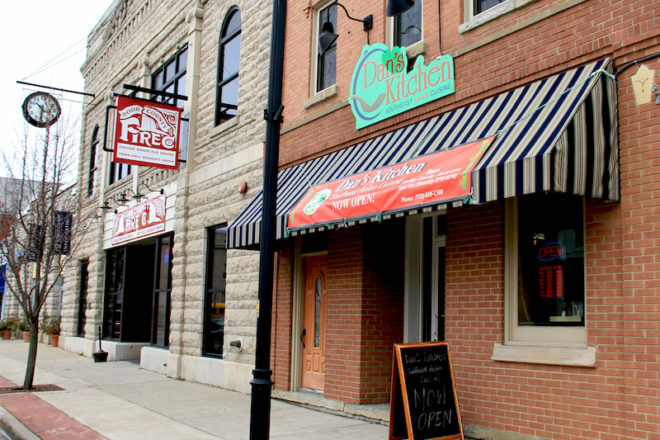 A permanent option for Southeast Asian food was lacking in Door County; the neighborhood was clearly hungry for it; and Dan heeded the request.